Okay you can use Autoruns like you did with the others to remove. It looks like it is only one entry an schedule updater. Type Sophos in Filter box and Delete entry. Glad it worked so your drivers should all be updated. What else is going on with your computer? See the enclosed picture that shows the Sophos entry to remove. Next step, follow steps in link below. Are you saying that i have to upgrade from windows 7 and go on to windows 10 ? any idea how i can get google chrome to stop crashing ? sorry i should have said that i have already done that step for sophos and the programme still won't go. Edited by adamdyak875, 22 April 2018 - 03:51 AM. I am sorry, I got confused and thought you were using Win 10 so please disregard that step. If it will not delete from Autoruns, then it may have to be deleted in safe mode. 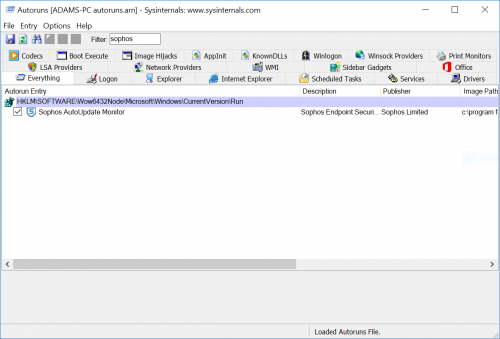 Will it allow you to Disable by unchecking the box in Autoruns? Download the following program and follow instructions on how to use to clean up your browser. I also recommend resetting it to Reset to default settings. Click on the X button after the scan shows Done! ​For Best Results Run the Repairs option Twice! google is still crashing ? not sure if i have any viruses ? are there any scans i can run or previous scans i should rerun ? still can't get rid of sophos ? How will i no if it has worked ? Edited by adamdyak875, 28 April 2018 - 02:57 AM. Edited by adamdyak875, 29 April 2018 - 10:08 AM. Sorry, I had a surgery procedure today but will try t look at tom if up to it. Please remind me if don’t hear in next few days. Thanks doe your patience. It's fine if it takes a few more days. when i have just tried to delete Sophos in Autoruns (again) it came up with this (see attachment "Document"
Okay, lets try cleaning up your browser and see if it works better. If not, then try firefox, opera, Edge etc and see if the same problems. MD "%userprofile%\desktop\SystemDiagnostics"&dxdiag /t %userprofile%\desktop\SystemDiagnostics\dxdiag.txt&systeminfo > "%USERPROFILE%\Desktop\SystemDiagnostics\systeminfo.txt"&msinfo32 /nfo "%USERPROFILE%\Desktop\SystemDiagnostics\msinfo32.nfo"&wevtutil qe System /c:20 /f:text > "%USERPROFILE%\Desktop\SystemDiagnostics\SystemEventlog.txt"&wevtutil qe Application /c:20 /f:text > "%USERPROFILE%\Desktop\SystemDiagnostics\ApplicationEventlog.txt"&wmic /output:"%userprofile%\desktop\SystemDiagnostics\Software.txt" product get Name, Version&wmic /namespace:\\root\SecurityCenter2 path AntiVirusProduct get * /value > "%USERPROFILE%\Desktop\SystemDiagnostics\Antivirus.txt"&If Exist "%SystemRoot%\minidump\*.dmp" copy %SystemRoot%\minidump\*.dmp "%USERPROFILE%\Desktop\SystemDiagnostics"
Edited by dmccoy, 03 May 2018 - 02:13 PM. Are there several files in the SystemDiagnostics folder? Is this error happening when you try to compress it to a .zip file? If you cannot get that to work you can upload all the files in the folder. 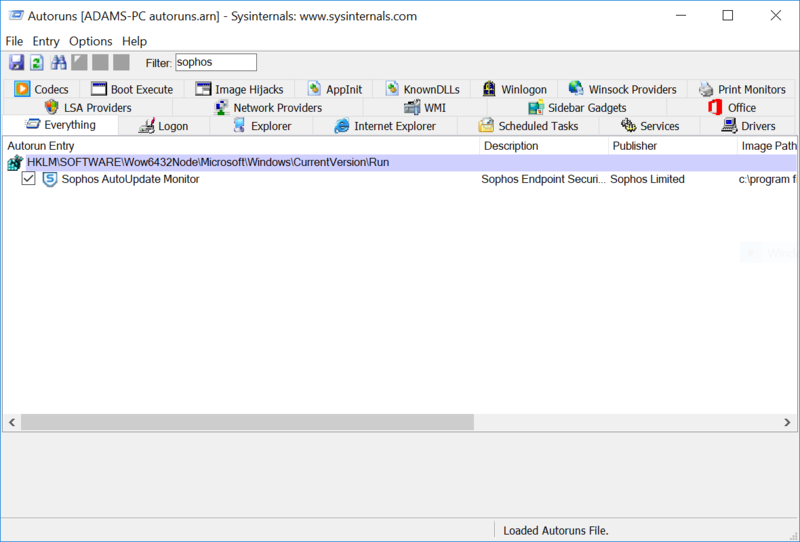 Sophos AutoUpdate is showing under your list of installed software. Does it give you the option to uninstall it? Did you try removing with Autoruns in safe mode like I suggested? Did you perform the CCleaner steps and did it make any difference of your browser crashing?